Edinburgh-based travel search engine Skyscanner has introduced the ability to find and compare train tickets in the UK. The feature is currently available the UK-based users of the iOS app, with the feature due to land on Android shortly. The feature is powered by Trip.com, which is owned by the Chinese travel service Ctrip, which acquired Skyscanner in 2016 for $1.7 billion. Tickets are sold without any booking fees (unlike its biggest rival, The Trainline). According to TechCrunch, this feature will also come with 24-hour customer service. There are some limitations, however. Firstly, train journeys are limited to the UK. In its present incarnation, you can’t, for example, book a Eurostar ticket from London to Paris. You also can’t combine train journeys with flights, which is a bit of a shame. 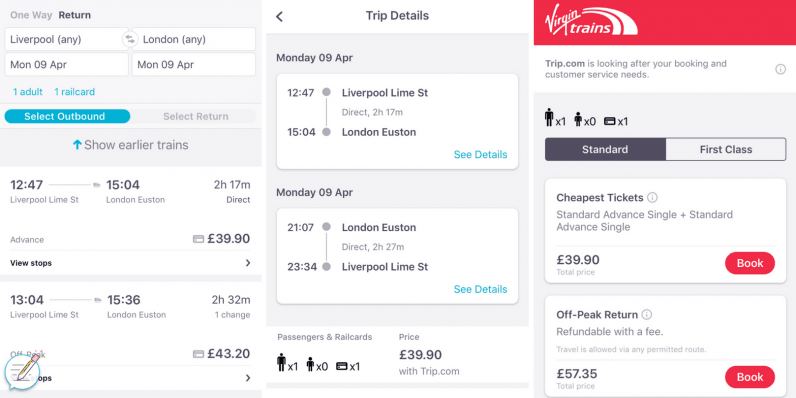 Given how tightly regulated train tickets are in the UK, it’s unlikely Skyscanner will compete on price. Its biggest competitive advantage here is the fact that it’s introducing the feature alongside easily one of the most popular travel booking services around. Booking tickets felt pretty sleek, and the user experience was a marked improvement over the Trainline and Virgin Trains websites. It’s clear Skyscanner has paid a lot of care here. Skyscanner says it’ll expand the feature internationally “in due course.” In the meantime, if you’re based in the UK and have an iPhone, you can check it out here.